Generally you rush to drink water only when you are feeling hot or you have been engaged in some sort of physical activity. 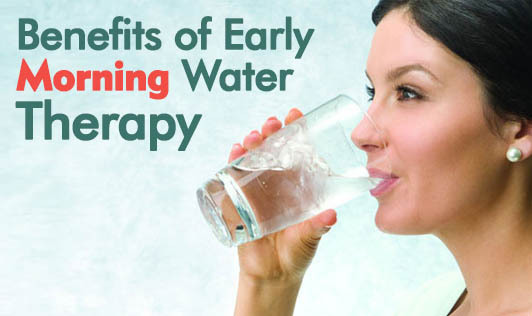 However, did you know that drinking water early in the morning, immediately after waking up can have amazing health benefits too? • Stomach: Drinking water on an empty stomach helps cleanse the colon and allows better absorption of nutrients into the system. • Metabolism: Drinking at least 2 cups of water early in the morning will boost your metabolism by 24% and help you lose weight. • Cells: Drinking water in the morning hydrates the cells in your body. The sprint of hydration helps in producing blood and muscle cells. • Skin & the Entire System: A high dose of water in the morning helps to remove all the toxins from your system and leaves you with a glowing skin. • Lymphatic System: Water flushes and balances your lymphatic system increasing your immunity and thus helps you fight a variety of illnesses. • Drink 1.5 liters of water immediately upon waking up, which equals to 5 to 6 glasses of water. • Avoid eating or drinking anything for 1 hour before and after drinking the water. • Do not consume any alcoholic beverages the night before. Drinking 1.5 liters of water at a time may be difficult in the beginning, but your body will gradually get used to the protocol. To make drinking 1.5 liters easy, try drinking 4 glasses of water first, wait for 2 minutes, and then drink the last 2 glasses. The more water you drink, the more health benefits you will experience.